2018 was a very satisfying season for the Buffalo Bills and their fans as they made the Playoffs for the first time in 19 years under new Head Coach Sean McDermott. Now that everyone has the taste of Playoff football, is the Bills roster strong enough to compete for a Playoff run in 2018? The answer is yes, but the Bills have to be lucky and keep key players injury-free for the entire season. What still hurts the Bills is that because of salaries negotiated by the previous front office regime, they were handicapped going into the 2018 off-season. The Bills didn’t have the cap space to allow them to do much in free agency and they also needed to find a potential franchise quarterback of the future in the Draft. Picking where they were picking at 21 and 22, the Bills weren’t in position to get one of the top quarterbacks in the Draft. The Bills held a lot of draft capitol which potentially would allow them to move up in the draft. But they also had some players who weren’t seen as players that would help them win going forward. One such player was offensive tackle Cordy Glenn, who was a solid player but because of injuries didn’t play much in 2017. The Bills won without Glenn in ’17 so the decision to trade him would give them more draft capitol and free up cap space. After that decision was made, the Bills traded Glenn to Cincinnati for a swap of first round picks, which gave the Bills the 12th pick instead of the 21st in the first round. Getting to the 12th slot was huge in the eventual trade up to seven to draft Wyoming quarterback Josh Allen. As we get ready for the rookie Mini-camp and OTA’s a look at the Bills roster shows us where they are and where they need to go between now and training camping late July. The quarterback position is set but a question mark with A.J. McCarron, Nate Peterman and Josh Allen. McCarron has been in the League for four years and is ready to be a starter but because he has never held that role no one knows if he can be a viable NFL starter. I liked the drafting of Peterman last year and even though he had some unsteady performances in 2017 I think he has a bright future in the League. Peterman doesn’t have the physical traits of someone like Allen but he is smart, instinctive and has as quick a release as any quarterback in the NFL. I feel we will see a big jump in Peterman’s play come training camp. Allen is the future but he is not ready to play. The best thing for him is to sit and learn in 2018 and take over a year from now after he has had a chance to become familiar with the offense and the NFL in general. Like quarterback, the wide receiver corps is a question mark. Gone from last year is Deonte Thompson and Jordan Matthews. Like with the quarterback position, what the Bills have now is a question mark. Last year the Bills acquired Kelvin Benjamin from Carolina. Benjamin with his size and ability to get open is an excellent possession-type receiver. He has had problems staying healthy the last few seasons but if he can stay healthy then he can be the quarterback’s best friend. Last year’s second round pick Zay Jones should be ready for a breakout year. The talent is there and now he has gotten used to the League his play should step up. Granted, his off-filed issue earlier this year is a concern but hopefully that is behind him and he is ready to become a pro. 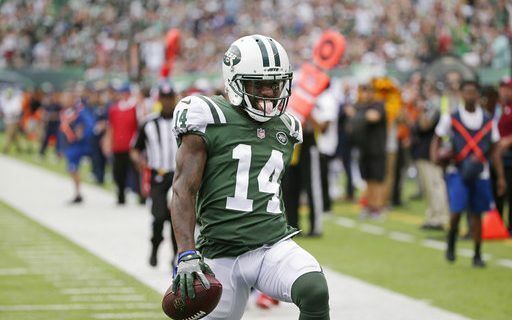 An interesting acquisition for the Bills was Jeremy Kerley. Kerley can be a deep threat but he has been inconsistent since he was a big play guy early in his career with the Jets. The Bills have to hope that Andre Holmes and Kaelin Clay and one of the late round rookies (Austin Proehl, Ray-Ray McCloud) come on to provide good depth in case of injury. Running back is in good hands with LeSean McCoy, who ran for over 1000 yards last year. At 29, he still should have a few good years left. As a primary backup, the Bills acquired Chris Ivory who was with Jacksonville last year. Ivory gives the Bills an inside presence in the run game and should be an excellent complement to McCoy. The tight end group is pretty much the same players we saw last year headed by Charles Clay. Behind Clay is Nick O’Leary and Logan Thomas. None of these three are considered dominate blockers and the Bills have to hope that Khari Lee is able to fill that role. A strong blocker at the tight end position helps the run game. Like quarterback and wide receiver, the offensive line is a question mark. Long time center Eric Wood was forced to retire and Richie Incognito also decided to step away from the game. That leaves a hole in the line and until we get into the preseason we won’t know just who or how good the replacements are. Replacing Wood at center could be Ryan Groy who has performed well when called upon. Groy could also be the person who replaces Incognito. Veteran Russell Bodine, signed from Cincinnati, figures to be in the mix at center. Regardless, the other new starter could very well be former starter John Miller. As a rookie, Miller looked as if he was going to be a quality NFL lineman but he hasn’t progressed as hoped. Going into camp the tackles will be Jordan Mills and Dion Dawkins. Dawkins will be a fixture on the line for years to come but Mills has been an up and down player (mostly up recently). Conor McDermott is entering his second year and he could be ready to assume more playtime. Free agent signee Marshall Newhouse provides good depth and he is capable of playing guard or tackle. What helps the Bills line is they are coached by Juan Castillo who is one of the better O-Line coaches in the NFL. Juan will get this group ready to play and play well!